Daisy was adopted in 2015. Her name was Darlin but soon became Daisy. ​She brought love and joy to her mom. She passed away from Cancer, but will always be in our hearts. ​Not long after Sidney went to the Rainbow Bridge Lucy Bloated and was rushed to ER and had surgery and all went well for several days. She went out one evening before bed and colapsed and was rushed to hospital , but sadly it was to late. She is once again enjoying all her days with Sidney. ​We’ve had them for five years. When they came to us they were Snoopy and Lucy. I’m not into cute dog names and besides Snoopy was a beagle not a basset. I read up about changing their names and one article recommended finding a name that had the same initial beginning and ending sounds - so at was ssss and eeeee. Snoopy became Sidney. We got them in the fall of 2013. Lucy’s name stayed the same. John wrote: Hannah passed away this morning. She woke me up at 7 and was not going to let me out of her sight. Acting strange. I told her to hang on and we would go to the vet at 8. Gave her hugs, just stayed with her and was holding her as she passed. Had her to the vet a couple weeks back for her and Snickers Check and she was beginning to retain fluid and had an enlarged heart. The vet put her on four meds and she seemed to be doing better. She was outside with me yesterday helping me remove snow to make them their doggy trail around the yard and all seemed normal. Different scenario this morning. She woke me about 7 and wasn't acting like normal. I gave her hugs, stayed with her and was holding her as she passed. What a heart yanking feeling. Now it's just me and Snickers. The kids didn't like being separated, if I'd take one to the vet and leave the other home...they'd sure let me know about it!! I've been through this 7 times and it never gets any easier!! Great pictures and memories shall remain with me forever!! Snickers is still asleep this morning, I don't think she knows her Sis is gone. This is going to be a real SAD Day for us both!! ​In 2016 Hailey who came to rescue with stage 1 mammary gland cancer and had surgery has found her happy home with a loving family. We are so happy for you Hailey enjoy your new life. Such a nice old guy we wonder WHAT WAS HIS LIFELONG OWNER “Guardian” THINKING OF WHEN THE GAVE HIM TO A SICK PARAPLEGIC person with no money!!! He has been shuttled off to other different people for his past year. He needs HELP not shunted about. I wonder if his first owner of 11 years ever even thinks of what’s happened to him. At 12 he will be next to impossible to place. We are so glad we have room for him and wonderful friends to be his new forever surrounding family. . He found love and kindness at the end of his life and was doing so much better. But today he just wore out and got his new wings and flew to the Rainbow Bridge. Roscoe was able to celebrate St. Patrick's Day early with his dad. The day after his celebration he headed off to the Rainbow Bridge where everything is as green as green can be. ​Roscoe was adopted from BROPS in 2017 and shortly after he was, it was discovered he had cancer. His time with his dad was short, but what a wonderful time it was!! Bodie came to live with me on July 1, 2004, via Alexa, who went all the way to Spokane to rescue him! the United Kennel Club and AKC, Bodie achieved eight obedience titles - and he loved doing it! My dearest boy passed​on 2/7/2018 and will always be in my heart. on 2/7/2018 and will always be in my heart. Emmett was adopted from BROPS by Madeline Miller McKay in August of 2005. He lived to be 16 years old. 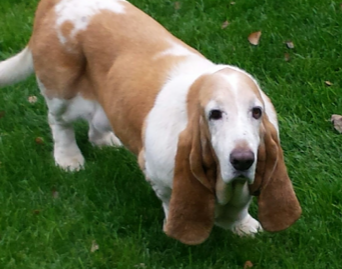 He was a very gentle hound & loved his basset brothers and sisters who were adopted after him. Maddy wrote: "He was very sweet to our Maggie who we adopted at 12 years of age. He protected her and made sure Daisy Mae let her be. Emmett was a different basset. He never liked treats unless they were my homemade chicken strips. He was a very picky eater but we loved him so much. He was very gentle with babies and he also liked his backside scratched". We will miss him so much! Wanda Wiggles joined our family on October 26, 2012. From the moment she walked through our front door for the home interview, we knew it was a perfect fit. We saw a dog who had been described to us as incredibly anxious, then transform into a tail wagging companion who loved the constant attention and belly rubs she received from each member of our family of 5. Our three daughters were her pride and joy. She reminded me of the nanny dog in Disney’s Peter Pan film. She had a sense for whenever they had a tough day, and would always stick close to whomever she felt needed “doggy cuddles” the most. I watched her as she always greeted them with love and excitement. She seemed to genuinely take pride in her family. On August 8, 2017, Wiggles passed away in her sleep. She never complained that it was much harder to get around than it used to be. Even in her old age, her eyes always twinkled and she always seemed to smile. But I could tell that she wished she could still run around the backyard the way she used to. On her last day with us, she rested under her big shady fern in the backyard, as she always would. She was loyal and a true companion. While she is deeply missed by this family, we are truly grateful for what a gift she was to us. We were blessed with such great memories with “our girl”. Penelope came into rescue in 2008 her family no longer wanted her after 8 years traveling with them all over the world. She became the spokes dog for BROPS on FaceBook and was at all our Parties. She started Pennies for Penny to raise money for BROPS to care for dogs in rescue like she had been. She was loved by all and missed. She is now one of our angels looking dow on us from the Rainbow Bridge. Tinkerbell came into rescue 7 years ago a product of divorce, and neglect. She did not trust people at all. She would bite. This is what prompted the nick name of Stinky Tinky. Alexa and JP worked very hard to gain her trust. During the next 7 years she lived with them she suffered from liver disease, and back issues. Tinker in time over the years her bad fur was replaced by soft fluffy coat and her eyes became soft pools of brown. Tinker still couldn’t be trusted, but became a fixture around BROPS. She blossomed into such a funny girl. She would play with a puppy as fast as she would scold them. Tinky had her own personal parties, and after 6 yrs of trying to find her a forever home Alexa and JP adopted her. Deep down we think she didn’t want to go anywhere else because she knew it was her home. She love to go with Jeannette on a long walk. We loved you Tink enjoy your new wings and fly free to the Rainbow Bridge. Charlie came in to rescue October 11, 2011, and lived with his foster mom and dad Gary and Joni until his passing. The person who gave Charlie to rescue did not tell us he had seizures. And not just seizures , but uncontrolled seizures. He took a lot of care and visits to neurologists, but in time his seizures were controlled. One can only wonder what kind of life he had before coming to rescue. Without the love and support Joni gave him he would never have known how wonderful life could be. Many of you have met Charlie at BROPS Fun Day and Halloween Parties over the years. We lost Charlie our forever foster of five years last night to heart failure caused by aspiration pneumonia. It was so sudden. He showed distress around 10 pm we rushed him to ER vet and he was gone by 5 am. I am still in shock always thought he would go from seizures. My heart broken and we are devastated beyond words. We were there with him giving him kisses and telling him how much we loved him when he made his journey to the bridge. He was a happy boy who loved life to the end. We will miss him making us laugh everyday with his silliness. Thank you Alexa Paul and BROPS for trusting me to care for him. He was loved by everyone he met. Fly free sweet Chuck you are now seizure free and can totally enjoy the buffet at the bridge. This sweet senior was left at a high kill shelter in California after she was no use for producing puppies. A Good Samaritan rescued her and brought her to Washington to find a new home. She is a lovely old lady that seeks out attention and pets. ​She lived her life in rescue and is now flying free. ​Today I said good bye to Jake. He was a special hound that filled a hole in my life after I loss both my houndie boys with in 2 months of each other in 2011. In late May of 2011 Alexa Paul called me on her way home for the King County Kent Shelter saying she had a boy for me. It took me multiple visits and lots of thought, a month later Jake became part of my family joining Tallulah. Jake did not have a mean bone in his body. He learned to avoid Tallulah when she was in a mood. Jake love hanging at Aunt Joni's and her pack while I worked. The best was he loved doing home checks. In 2012 I loss Tallulah to cancer, Jake stepped right up and was welcoming to foster pups that I would bring home. I could take him anywhere and he was a fine representative of Basset Rescue of Puget Sound. JJay was a goof ball. Some mornings he would wake up and jump up and down on the bed like a little kid barking for joy. Out at the dog park he would just stop what he was doing to bark for joy. He was an awesome traveling dog. He has made countless trips to the Washington coast and to Oregon for the Oregon Basset Olympics. I want to thank everyone who Jake graced your couch for a nap or you took a nap with him. I will miss him, but I know he is still with me in spirit and will help send me another senior hound to love and continue my work with the rescue. Be free sweet boy Jake. Sweet Bitty Business came into Alexa's and JP"s right after they moved back into their new home after they had lost the other to fire. She greeted every newcomer to rescue with curiosity and joy. From puppyhood Alexa would draw her into her lap and they would cuddle every evening. Bitty left this earth this afternoon to join others at the Rainbow Bridge. We at BROPS will miss her energy and enthusiasm. God Bless , RIP Bitty Business. 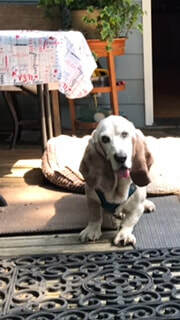 With sadden heart Basset Rescue of Puget Sound has to let you all know Rookie has gone to the Bridge. He came to us 3 years ago over weight, having a hard time moving, and dribbling pee because of his hips. Alexa was able to nurse him back to health and he became such a joyful boy. He loved going to the dog park and running and taking walks with our volunteers. Over the last few weeks Alexa had noticed that he was just not quite himself. Shortly thereafter Rookie's condition deteriorated and it was time to go to the bridge. Rookie is now running with the angles and no longer in pain. We love you Rook-Rook, the house will not be the same. We want to Thank Rookie's Aunties from Debbie's Dawgs for all the love and support you showed him. Please do something in Rookies memory. It is with a sad heart that we report Watson has gone to the Rainbow Bridge. He was one of our longtime fosters who found his home with Patty. He loved to play and travel with his brothers, Jake the Basset and Magoo the Shitzu. Many of you will remember the three of them at Howl-a-ween parties and possibly at some of the parades in the local area. Watson, like other older dogs at BROPS, are wonderful companions and will fill hearts with joy. Give on a chance and you will not be disappointed. He is on the end the big handsome red and white guy. Vikki Keil is one very special lady . All of her's are rescues and she Fosters and helps with rescues besides. Oh the Spencer Stories Vikki could write a book!! Spencer was so very lucky to have been taken in under Vikki's wing. He was damaged when he came in to her, so sick in body and mind as bad a boy there ever was. Spencer was a splendid big Basset Boy the changes for the good happened for him. He ruled the roost, was ornery, ate the carpet and did lots of naughty things. But Vikki let him grow to be the very best dog he could possibly be. And he was so loved. Fly Free Handsome Boy you will be missed. 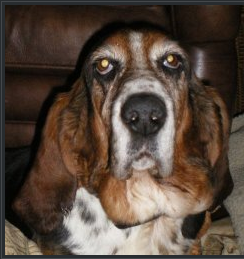 Rosie - a much loved Basset that got to live out all her years in Rescue. She was a staple around the rescue laying if front of the fire and bossing the other dogs around. What a pretty girl. She was unexpectedly diagnosed with cancer and had to be helped to the bridge. WE LOVE YOU SISTER! Wally was a foster failure, he was loved and cared for at the rescue until the very end. We love you Wally. Wally has had a fantastic life with a loving mom but life situation has changed and he needs to find a wonderful retirement home. He is around 8-9 years old but full of energy still. A little about him, he does not really like other dogs on first meeting and would do best as an only dog. He was abused as a puppy and young dog and never fully recovered his confidence so would not do so well with children. He LOVES to be with his owner and really will stick to you like glue and give you lots of love. Please consider this cared for older dog an addition to to your home.